Hi everyone! I'm posting over at Twine It Up! 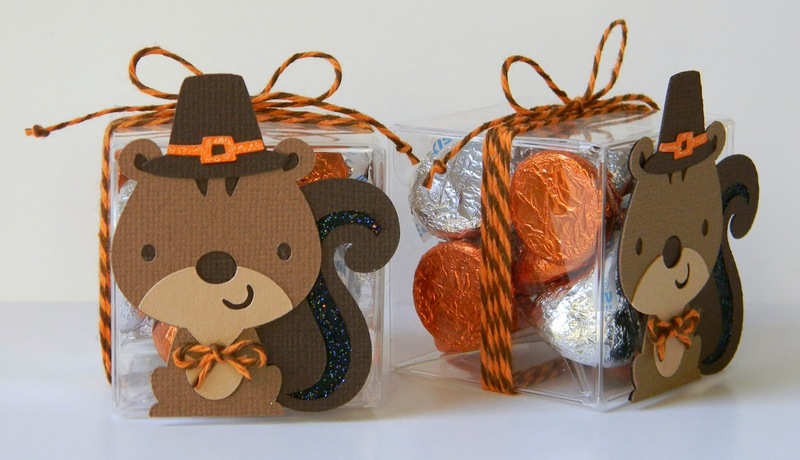 with Trendy Twine today showing these Thanksgiving treats you can set at your table. 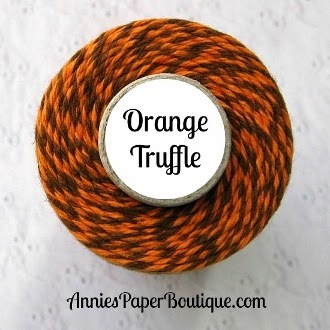 I used Orange Truffle Trendy Twine and Mini Candy Cubes from Annie's Paper Boutique. I filled my box with some Hershey Kisses and then wrapped the Orange Truffle Trendy Twine around the cube and finished that off with a bow. 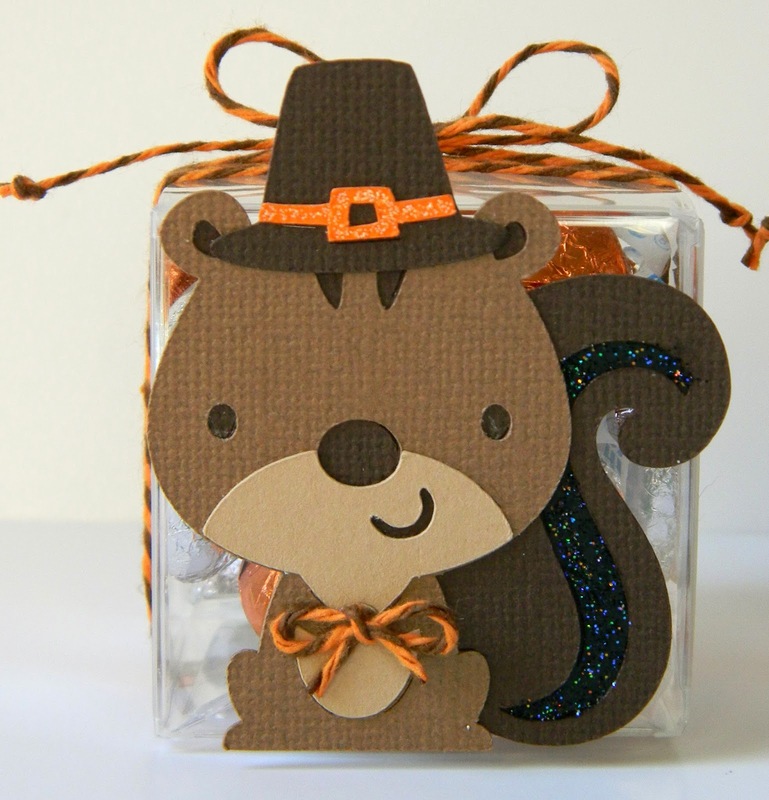 The cute Thanksgiving squirrel is from Cricut Create A Critter 2 cartridge. He is about 2 1/2 inches tall. I added a twine bow tie to him and some Black Diamond Stickles to his tail. It's on the box with some pop dots. Be sure to join the Twine It Up! with Trendy Twine Facebook Page to share your Trendy Twine creations! Great job on such darling boxes! Helen, these are so CUTE! 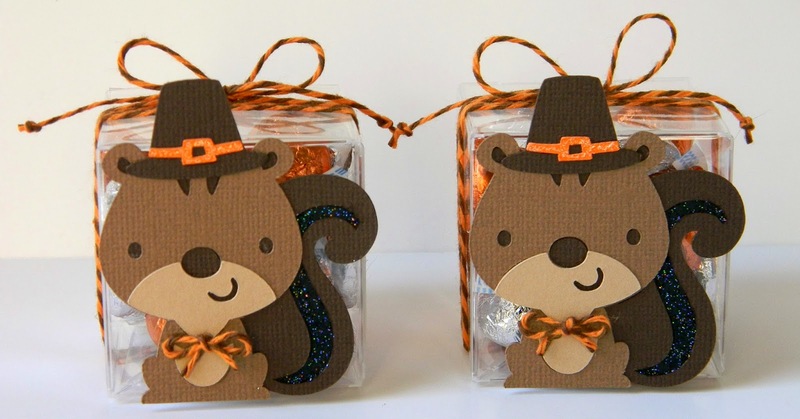 i JUST love the squirrel and the boxes are my fav! BTW, do you use a light box for your pics? They look GREAT! Thanks Shelly! I do not use a light box. I use foam core cut in half and have one for the bottom and stand the other one up from behind. I take my pictures in my kitchen by the glass doors and I have windows in there too. I do a +3 on my camera brightness setting and use the close up. Then I use PicMonkey to edit them. I saw some tips on how to do this--Under Colors, I neutral pick the white and apply; then on exposure, I click auto adjust. These actually didn't need much of the Pick Monkey adjustments; it just depends on the lighting that is in my kitchen. Night pictures do not do well. I have really struggled with picture taking before so thank you! These are precious and eye catching! These are so super ADORABLE!!!! LOVE them Helen!!!!!! Love your treat boxes! The squirrel is absolutely adorable, love the bit of sparkle to him!